Markings: The left side of the slide is marked “Mod. GB / 9mm Para”, with Steyr’s logo and “9mm Para”, the right side is marked “MADE IN AUSTRIA / P 12281”, with a proof mark, “NPv” and “ETF” date code, the top is marked “Gun South, Inc., Trussv. AL.”. The right side of the frame is marked “P 12281” with two proof marks and the date code. The inside top of the slide is marked “54” and “44”. The magazines are marked “ 6 / 12 / 18” next to three witness holes on each side. Sights / Optics: The pistol has a dot combat sight configuration. The front sight is a blade with a white dot integral to the slide. The rear sight is a flat top, square notched base with two white dots, the base is dovetailed onto the slide. Stock Configuration & Condition: The grips are impact resistant checkered synthetic grips with a dull black finish for glare reduction. Each panel has Steyr’s logo in the checkering, with smooth areas surrounding the checkers. The left panel has a scratch at the top-rear, otherwise there are only light handling marks. The checkering is sharp. There are no chips or cracks. Overall, the grips are in Fine-Excellent condition. Bore Condition: The bore is bright, the polygonal rifling is well defined. There is no erosion in the bore. Overall Condition: This handgun retains about 97% of its metal finish. The left of the slide has a small scratch at the bottom-rear by the mark on the left grip panel and slight thinning on the top edge of the flat. The right of the slide has a couple of light marks and a small spot of freckling behind the slide serrations, a small impact mark on one of the serrations and light thinning on the top and front edge of the flat. The “krinkle”-finished frame and polymer trigger guard show only light handling marks. The barrel has light operational wear and discoloration from fouling. The screw heads are sharp. The markings are clear. Overall, this handgun rates in about Fine-Excellent condition. Mechanics: The action functions correctly. This pistol features a gas-delayed blow back system, fixed barrel, decocker, low profile serrated hammer, extended slide release, decocker and quick takedown lever. The slide has almost no play to the frame. The double action trigger is smooth, the single action has a smooth takeup with a little creep before breaking. We did not fire this handgun. As with all used firearms, a thorough cleaning may be necessary to meet your maintenance standards. 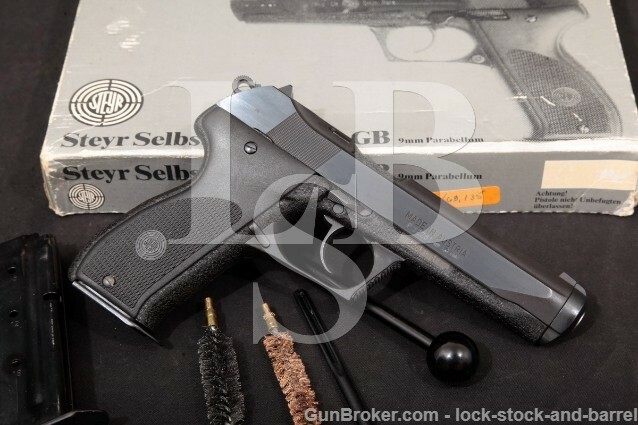 Box, Paperwork & Accessories: This pistol comes in a two-piece gray cardboard Steyr box with red-flock tray holding a cleaning rod, two cleaning brushes and a total of two 18-round magazines. The box has scattered wear with tape-reinforced corners on the tray portion and fraying at the corners of the lid portion, in about Good-plus condition. The cleaning brushes show use. The magazines have light operational wear, strong springs and intact feed lips, in about Very Good-plus condition. Please note, no magazines will be included for purchasers who reside where they may not be legally transferred. Our Assessment: Steyr’s gas-operated offers light recoil and better than average accuracy with its fixed barrel. It uses a gas delayed blowback system virtually identical to the last ditch German Volkssturm rifles. Basically, the front half of the slide acts as a gas piston, and ports in the barrel allow gas into that piston while the bullet is still in the barrel, thus slowing down rearward movement of the slide. Gas sealing rings are machined directly into the barrel, to prevent that gas from venting down around the recoil spring. The piston sleeve rotates to unlock from the slide for disassembly. This is a unique design and this example is in Fine-Excellent condition with a proper box and accessories. The grip meets one hand like that of a best friend, the 18 round magazine capacity is completely awesome for a gun designed in the lat ’60s, and this pistol looks ready to handle anything. For a 1984 duty class pistol, it has been treated well, while seeing a little bit of use. Please see the pictures and good luck!